Known for his outstanding trumpet playing skills, David Longoria is one of the most popular instrumental artists in the world today. His appeal, sparked by his love of Latin rhythms, has ridden the wave of such popular artists as Shakira, Ricky Martin, and Enrique Iglesias while remaining true to his own roots and interests in many different forms of music. Forging his own combination of Latin, Jazz, and Pop influences, David Longoria has carved a unique path in music. Known as “Longoria Latin”, a music style that has excited fans of many different music genres around the world, David’s influences are as wide ranging as they are unique, a concoction of styles and rhythms that fuse together seamlessly over an incessant beat. This exciting dance music style which harkens back to the days of Herb Alpert and his classic instrumentals is infused with the relentless rhythms of Shakira and Ricky Martin that appeals to a new generation while reminding us of the exciting dance music beats of the earlier times. In David’s music, you catch glimpses of greats such as Arturo Sandoval and Michael Buble that are mixed with David’s unique talents and presented in a fresh, exciting way. David’s talents were noticed early in his life, as he began signing along with his Aunt Betty at the tender age of 6 months. His love of music progressed through his early childhood as he played the drums, then clarinet before he discovered his calling to master the trumpet, to which he credits the great Al Hirt for inspiration when David saw him playing on television. David Longoria’s talent extends beyond the trumpet to singing and songwriting. He has crafted literally hundreds of songs for himself and many other popular artists as well. Perhaps David is best known in the US for his Dance/Pop hit, “Deeper Love”, featuring Dance/R&B singer Cece Peniston, which rose to the top of the US Billboard Dance charts as well as topping most of Europe’s similar popular music charts. David Longoria’s passion for music infuses all his performances and his PBS TV special “Baila!” captures him at the peak of his burgeoning career. Full of life, energy and song, David Longoria conveys his love of Jazz, Latin, and Pop rhythms to his audience through his mastery of the trumpet and forcefulness of his singing. “Baila!”, a 90 minute live music special, filmed in HD presents an exciting, unforgettable show that will appeal to young and the young at heart alike. David Longoria’s influences are many, even extending to his love of such singing greats as Andrea Bocelli, whose crossover appeal to Pop from his more sophisticated classical roots has had a major effect on David. Watch for PBS stations in your area as they present “Baila!” starring David Longoria. 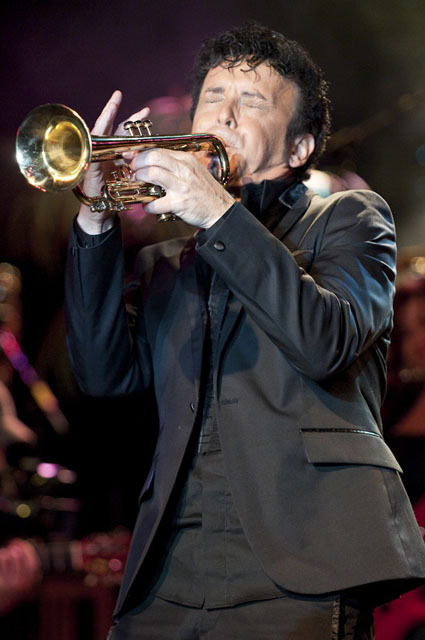 You can find out more about David Longoria, his appearances and tours at http://www.davidlongoria.com .